Attorney Marcellus A. McRae served as keynote speaker at Southern California Edison’s 14th annual Black History Month celebration Feb. 5 in Irwindale. 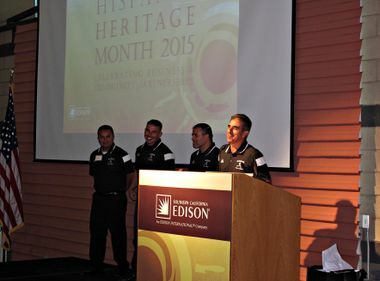 Pedro Pizarro (left), SCE president, joined Robert “Bob” Young (middle), president, Royal Crest Building Maintenance, and Eric Fisher (right), SCE Supplier Diversity and Development, at SCE’s 14th annual Black History Month celebration Feb. 5 in Irwindale. Lisa Cagnolatti (left), SCE vice president of Business Customer Division, joined pastor Bobby Newman (middle) from Citizens of Zion Missionary Baptist Church in Compton, and his wife Claudia (right), at SCE’s 14th annual Black History Month celebration Feb. 5 in Irwindale. SCE honors African-American business and company partners. Forty years after Black History Month was officially recognized by the U.S. government, there’s still a need to celebrate the accomplishments of African-Americans, said Marcellus A. McRae, keynote speaker at Southern California Edison’s recent Black History Month celebration. 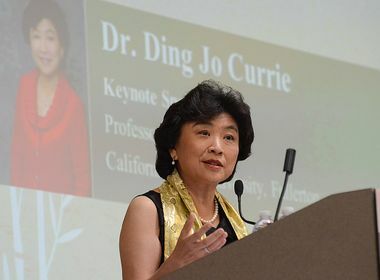 “Can we truthfully say that the study of African-Americans and their contributions to this society have been treated with equal dignity to that of white Americans and other Americans?” said McRae, partner, Los Angeles office of Gibson, Dunn & Crutcher at SCE’s Energy Education Center in Irwindale. “Sadly, we know the answer to that question and it is a resounding no. Until residual racism in society ends and people across the country fully realize their capability of treating one another as humans, the annual recognition is necessary, he added. More than 300 guests attended the 14th annual Black History Month event that recognized the contributions African-Americans have made throughout history and continue to make in the communities SCE serves, the state and nationally. SCE President Pedro Pizarro acknowledged the value of incorporating diversity and inclusion throughout the company’s work culture and in serving customers across its 50,000-square-mile service territory. SCE and its parent company, Edison International, also support diversity through nonprofit giving. Last year, Pizarro said, Edison International shareholders contributed $20 million to community organizations SCE serves, including supporting students’ education in the study of STEM (science, technology, engineering and math). During the program, three African-American business and company partners were honored by SCE for their achievements and contributions to economic growth, service to the community and participation in energy-efficiency programs. Accepting SCE’s Energy Efficiency Participation Award on behalf of Citizens of Zion Missionary Baptist Church was Bobby Newman, senior pastor, and his wife, Claudia, first lady of the church. Dr. David M. Carlisle, M.D., Ph.D., CEO and president of Charles R. Drew University of Medicine and Science, accepted SCE’s Community Partnership Award. Robert “Bob” Young, president of Royal Crest Building Maintenance, was presented SCE’s Diverse Business Enterprise Award.